A top-level villa with panoramic infinity pool, easy access on foot to Avlaki beach and Kassiopi, and much more besides! At Daphne, elegant, refined interiors merge seamlessly with impeccably furnished terraces whose views over the gently sloping olive groves and the bay below are mesmerising. A few minutes’ walk will take you to Avlaki beach and its seafront tavernas, while just a short drive away are Kassiopi’s shops and nightlife… if you can tear yourself away from the comfy confines of this exceptional villa! Inside: accommodation at Daphne is spread over three floors. The main entrance takes one into the large, welcoming living room, whose lofty, white-beamed ceilings, elegant furnishings and multiple French doors (which access the wrap around terraces and bring in the sea views), create an exceedingly luminous and welcoming ambience. To the left of the living area is the splendid, well-equipped kitchen-diner, which also accesses the surrounding terraces and the al fresco dining area. Stairs lead up to the generously proportioned master double suite, which benefits not only from a super en-suite bathroom with separate shower and tub and double sinks, but also a private sea-view terrace. Heading back to the living room and continuing down the stairs, one comes to the lower ground floor, which comprises a TV and sitting area, a twin bedroom, a double-twin bedroom and a double bedroom with feature fireplace. The twin and the double-twin have en-suite shower rooms, while the double has an en-suite bathroom with tub and shower attachment. All three bedrooms have sea views and access to a large terrace that runs for the whole length of the house. Outside: the outdoor areas of Daphne are a joy to spend time in, with numerous areas dotted around the terraces for dining, lounging, chatting and sipping on aperitifs. To one side of the main house is the large pool terrace, looking out to sea and infinity. The pool area is served by a large covered pergola, accessed from the kitchen and living area and fully furnished with comfy rattan sofas and chairs and a panoramically placed dining table. This terrace fans out around the house, front and back, to the other side of the property, where there is another shady area, furnished for reclining and repose. Steps lead down to the lower level, where there is another large expanse of sea-view terracing, complete with a covered sitting area, a dining table and a kitchen with barbecue, sink and draught beer dispenser! More steps lead down from here to the olive-tree-specked gardens. A gate to the side of the house allows guests to follow a short footpath down to the beach, where the crystal clear waters are ideal for swimming and snorkelling. All the internal communal areas and bedrooms access these terraces through large French windows and the master bedroom on the first floor has its own panoramic balcony. The beach below the villa is an easy walk from the garden gate down a path shared with three other villas. 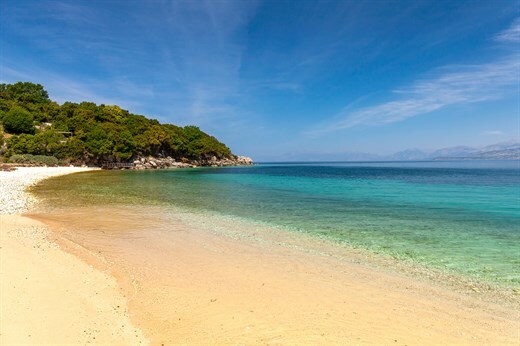 Gorgeous Avlaki beach is about 10 minutes' walk away. Daphne occupies an enviable position in the extreme northeast of Corfu, just a 5-minute drive from popular Kassiopi, with its restaurants, bars and nightlife, and within a few minutes' walk of the lovely Avlaki beach. Corfu Town, which is well worth a visit or two, is approximately 1 hour's drive south, and there are plenty of spots to stop off at for a swim on the way. Corfu's mountainous hinterland, where you can enjoy great walking and a different atmosphere from that of the coast, is within easy striking distance. There are also plenty of activities for kids nearby. "Daphne is a lovely villa, beautifully decorated and with fabulous views. The top floor bedroom is a delight. The cleaning lady was charming and very efficient"
Daphne is a beautiful, comfortable and homely villa. We loved the peaceful location. We enjoyed Daphne thoroughly and had a totally relaxing holiday for our 70th and our son's 40, made extra special by the care we were given. Very helpful staff and loved having a chef make our dinners. We really enjoyed the setting of Daphne and ate out less than we thought, as it would be hard to beat the view from the dining-table in the evenings. Very good vacation - excellent location, good destination and good villa. We had a wonderful week at Daphne and the house worked extremely well with three generations ranging in age from 2 to 62. We found it very spacious and comfortable, it is well appointed and the position is excellent. I would not hesitate to recommend it to anyone and have in fact already done so.